One of the biggest traps that foreign English speakers fall for is trying to speak TOO FAST. Yet so many foreigners are under the wrong impression that to speak fluent English you must speak fast. Well, most native English speakers would indeed speak English quite fast – just like any other native language speaker would speak their language. It’s not always the case though. There are situations when EVEN NATIVE SPEAKERS would find it hard to maintain a continuous, fast speech. Stressful environment, high expectations from others, not being familiar with the topic that’s being discussed – all these and a number of other factors may seriously impede any native English speaker’s natural ability to produce fast, continuous and uninterrupted speech. So if even native English speakers can run into such problems, why would foreigners like me and you be any different? I think that our ability to speak English shouldn’t be judged on our nationality grounds. We, just like any native English speaker, are entitled to have moments of confusion, take time to make the point, and it shouldn’t be perceived as an inability to speak fluent English. It should be taken for what it is – slower speech – and it shouldn’t be attributed to our foreign national background! One of my favorite actors Benicio Del Toro, for example, quite often speaks slowly and takes his time choosing the right words when giving interviews. He doesn’t give a damn about what others might think about it! And mind this – he’s a Hollywood celebrity and speaks fluent English. Well, originally he’s from Puerto Rico and speaks Spanish, but he’s spent most of his life in the States and his English is absolutely fluent. It’s OK to speak very slowly! All the above symptoms MAY indicate the typical English fluency issue. If you CHOOSE to resort to such techniques when speaking English and use them as means to explain your point in a conversation without being stressed out and nervous – it’s a different story altogether. It’s completely natural, and if your conversation partner takes it for inability to speak fluent English just because you’re a foreign English speaker – well… just ignore it! You should have more serious matters to think about than some arrogant person’s opinion about your level of spoken English. … you risk seriously damaging your fluency and confidence. Your eagerness to please your ambition or others will backfire and you risk getting completely tongue-tied. 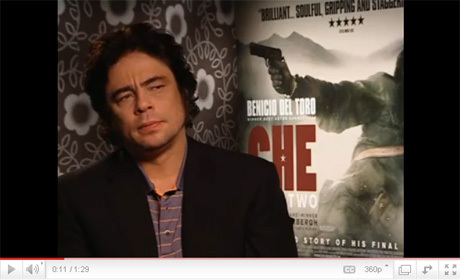 I’ve analyzed one of Benicio Del Toro’s interviews below. I’ve embedded the YouTube video below as well, so you can watch it first and then read the analysis below. If you’re always worried about what native English speakers will think of your slower speech, you’ll see how much you can learn from Benicio! Seriously – pay all your attention to the way he speaks if you often catch yourself speeding up your speech and eventually getting tongue-tied and stuck in a middle of conversation! im sorry but what does “rock on” mean? Robby, again you fire up an interesting topic! I’ll reflect more on that in my today’s Weekend Links post u2014 sadly, I have no time at the moment.nnRock on!